Any reason is a good reason to host a sale according to Valve (I concur). The company has launched a new Steam sale in which they’ve slashed prices on dozens of mystery-themed games in an apparent celebration of this coming Friday the 13th. With nearly 45 titles on tap, odds are that most will find something suitable for purchase. A quick check of the list revealed a handful of games that I’d be interested in playing (or replaying) including Alan Wake, the entire Max Payne series (Max Payne 1, Max Payne 2: The Fall of Max Payne and Max Payne 3), realMyst: Masterpiece Edition and the Dark Fall games (Dark Fall: The Journal and Dark Fall 2: Lights Out). At a combined price of $36.43 for all seven games, that’s a pretty solid deal. You’ll find games in the sale discounted by as much as 80 percent. Best yet, most of the titles don’t appear to be too terribly graphic intensive so you should be able to get by running them on older hardware. You’ll also notice that this isn’t a major Steam sale so there aren’t any daily deals or flash sales but that’s alright. If you don’t see anything this time around that tickles your fancy, you can always hold out for the annual summer sale later this year. 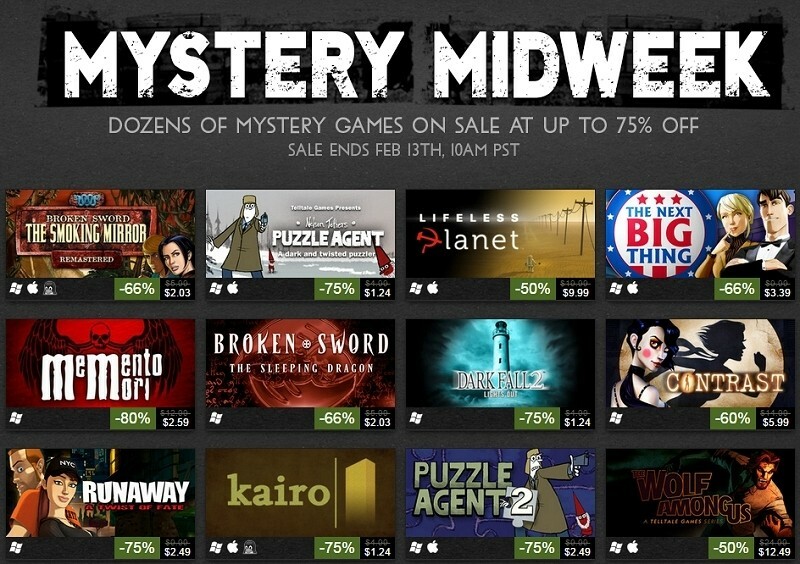 Are you planning to pick up any games in the Mystery Midweek sale? If so, let us know which ones in the comments section below.